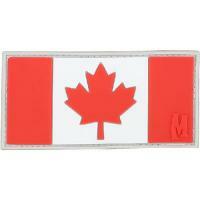 "Oh Canada, we stand on guard for thee..." The Canada Morale Flag patch from Maxpedition® features Canada's famous maple leaf flag in striking red and white. The PVC rubber material allows bolder, more defined designs and brighter colors than traditional materials. PVC is also extremely durable and wear-resistant, with easy maintenance using ordinary soap and water. The patch comes with a hook-backing that attaches to loop fields found on many Maxpedition® bags and apparel, guaranteeing easy on/off. The patch also includes its own loop field that can be stitched more permanently onto clothing or gear.